I Wrote, count ’em, Five Cards! I wrote five “Great to meet you!” cards yesterday for the Shop/08 panelists and cool chicks I met at the event. That means that I get to buy replenishment cards! These are the limited edition, linoleum block print cards that I purchased. They’re even hand signed, and numbered, by the artist. I might just frame one and put it up in my house. 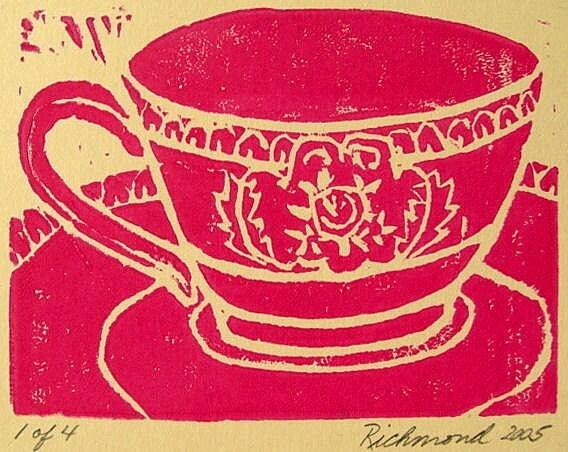 The artist, Ronna Richmond, only makes 10 prints of each design so these are very original and special. You can buy your own set of limited edition, linoleum block print cards by Ronna here. She’s only got a few sets left. Hi Anne-Marie-you were talking about cards, well, my mom makes these AWESOME cards from wildflowers that she collects and presses from NorthWestern Illinois. I believe that she has been approached or knows someone who works for Hallmark. I think that it is great or maybe it is just that I’m her daughter. But the best is that I so enjoy getting creative with my soap and reading all about your adventures. Thanks for just being there and letting us new soapies how it’s done! Very pretty! Truly a work of art. I’ve been wanting for years to try block printing…maybe I’ll do that for Christmas cards this year.